Malcolm Little was born on May 19, 1925 in Omaha Nebraska. His father Earl Little was a civil rights activists whos protests prompted death rates from the white supremacists group called the Black Legion and the family had to relocate twice before Malcolms fourth birthday. In 1929 there home in Lansing Michigan was burned down by the Black Legion and his father Earls body was found two years later lying across the train tracks. He and a friend were convicted of a burgarly and he served 7 years in prison and then got out on parole and thats when he choose X as his last name to signify his lost tribal name. He was a devoted follower of the NOI Nation of Islam and study hard the teachings of the leader Elijah Muhammed. He then eventually becomes the assistant minister of the Nation of Islams Detroit Temple. He then traveled to the middle east and Africa studying and learning his religion of Islam and when he returned in 1963 the Nation of Islam orders silence from Malcolm X in regards to President JFK's assassination. He began in the sixties to appear in numerous debates around the country and argued for the rights of African Americans throughout the country and believed in their freedoms and rights in America along with MLK Jr but did not always follow the practice of peaceful protests as MLK always seemed to do. He appeared on television shows, the radio, and even some college campuses throughout the country. 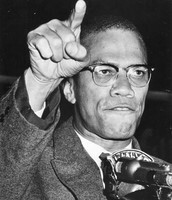 In 1963 the New York Times reported that Malcolm X was the second most sought out speaker in the United States, and is known significantly for the Unity Rally in Harlem which was one the nations biggest civil rights movements of its time. In 1964 he met the world champion boxer Cassius Clay and after speaking and meeting several times with Malcolm X her changed his name to Muhammed Ali and converted to Islam. On February 14th, 1965 Malcolm X's home is firebombed and then February 21st just a week later he is assassinated as he begins speaking at the Audubon Ballroom in New York. 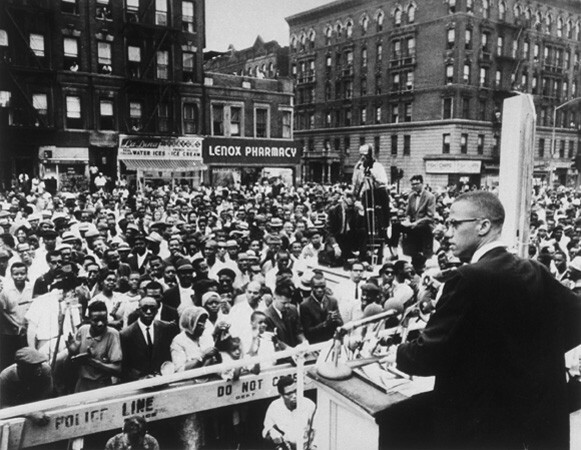 This is a photo of the Unity Rally in Harlem New York and is one of the biggest civil rights movements of the time. Malcolm X gave a speech talking about the freedom the blacks dont have and the injustice they receive and was impactful because most of the population of Harlem at this time was African Americans and were discriminated greatly against with few rights and freedoms. His speech was greatly debated because of the last line where he talked about god giving power back to its original owners the black man and this was a completely different then MLK's approach which was to use peace to assimilate with the rest of the country and that we are the same as the white not anything worse and not anything better.